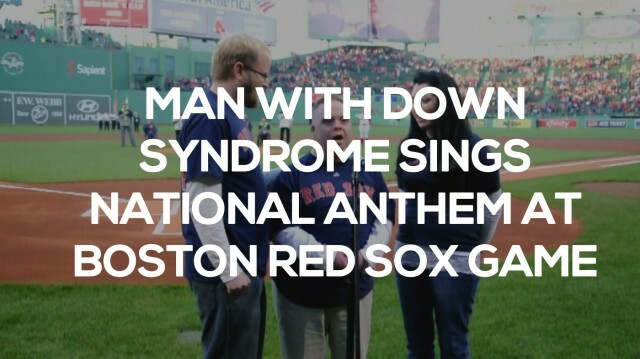 My wife sent me a link to this really cool story yesterday about 38 year old Michael Mullins (who happens to have been born with Down syndrome) a die hard Boston Red Sox fan who’s dream of singing the national anthem at Fenway Park finally came true! Michael really hit a home run with his version of the national anthem (pun intended!) Click play on the video below to see for yourself. I also enjoyed this video of Michael rehearsing with a person I assume is his dad. If so, I really love the fact that he has such a supportive dad! I really appreciate whoever sat this up at the Boston Red Sox organization. Way to go guys! What did you think about Michael’s performance of the National Anthem? Do these kinds of videos encourage you like they do me? Leave a comment below and tell me about it. And if you liked this video please be sure to use the share buttons below to share it! I think God really has chosen the right Dad for Noah. You guys are so inspiring and I want to share with you the Facebook-group of a swedish rock group. Some of the members have down syndrom. They have played many gigs, they even toured in Ireland and won the culture price in their hometown this year. He has some voice! Wow! Such an awesome experience. Thanks for much for sharing the video. As a father of a new awesome little girl who also happens to have Down Syndrome, stories like this are uplifting and also a reminder to stay focused on the present and not let these years slip away with worry. Down Syndrome is just something she has not who she is or will be. Hi, It was impressive and exciting to see his singing. The video gives hope. Thank you. Our son Matan is still a baby (one year and three months) but we are hopeful to see his achievements. Kudos to Mike! Great job. And kudos to the Boston Red Sox organization. Wish more professional teams used local fans like Mike to sing our National Anthem. Way to go Mike! You have a beautiful voice! Great video. My son (who is named Noah, too) has Down syndrome. Only thought I have is it would be nice to not have Black Eyed Peas as background music for this clip. The Black Eyed Peas have a very popular song titled: “Let’s Get Retarded”. Let’s let everyone know that the “R” word is unacceptable. Hi I am a mother of one month old daughter who is born with down syndrome. I am trying to gather as much as information to understand this condition . I am really worried for my daughter future.Please give me some advise. Thank for your sharing this content.